Coca Cola style email subscription box widget for blogger above comments, Below is method for how to add This professional and beautiful gadget to blogger blog. An email subscription box widget is the key of success in blogging era just like other widgets which helps you to achieve complete success in blogging. A complete success means awesome traffic, handsome money and loyal readers. The success of a blog is measured by its loyal readers which is indirectly a permanent traffic. A large group of people and readers who are interested in your blog and visit daily to your blog. But do you know how do you get such visitors or how to give them a chance to join your website or become a member of your blog so that when you publish a new post all of your readers will be informed and they will have access to visit your blog directly from their Inbox. To execute this you need an email subscription box widget. Here I will describe how to add an email subscription box widget for bloggers. There are various positions where you can add an email subscription box widget in blogger like in the sidebar, below the post title and above comments. So the best position from my point of view and my experience is above comment box because this is the position where your reader's cursor will come when he finishes reading the article. It is very obvious that most of the people become member or subscribe to your blog when they find something unique in your blog. So our aim should be to increase the number of blogger subscribers because more subscriber means more page-views. So below is the best and simple code to add the email subscription box widget to blogger above comment box to increase your subscriber and loyal readers. How to add the email subscription box widget to blogger above comment. Type ]]></b:skin> in search box. Now it's time to add this coca cola email subscription box widget to above comments so here is the HTML part. Now again find this piece of code. Now when you have found this one line piece of code , Copy the below code and paste it below the above one line code. Insert your Feedburner id in highlighted red color. I Hope you liked this coca cola email subscription box widget for blogger above comments, feel free to comment and share. How to add Facebook like box and Google plus add to circle box below the post title for sharing on social media sharing websites, An awesome Widget for blogger with hover effect. 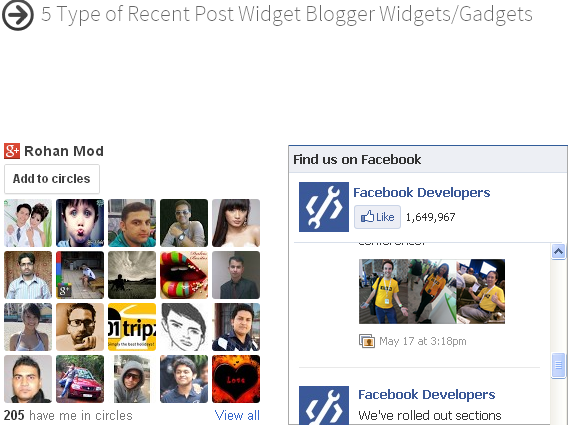 It is an awesome blogger widget with hover effect that puts Facebook like and Google plus box below the post title. It changes background color when you hover your mouse below the post title. Check out the below image before hovering mouse below the post title. It looks simple . And when you hover your mouse you will see images like below. Your posts reach to maximum people, More exposure of your blog. More likes and plus one means more search engine visibility. Few reports say every 4 persons out of 10 using social media sharing websites, so it is a good platform for the success of any business and for this purpose to make your blogging success we have shared many widgets like. So this blogger widget are the tools that will reach our posts in the entire world, where people really talk with each other so as a professional blogger our only aim is to reach up to those people which can make your business a success so try out the above widget and the one that I am going to discuss below. This widget will really help you. But few things also matters apart from just adding those widgets and that is the position there are the top 2 positions on your website where people mostly like to find some stuff and that is above comments and below the post title. So this widget is for below post title, this blogger widget will enable you to add Facebook like box and Google plus box side by side below the post title. And hence it will give your users a chance to share it with the two most popular social media sharing websites in the world and hence more successful. 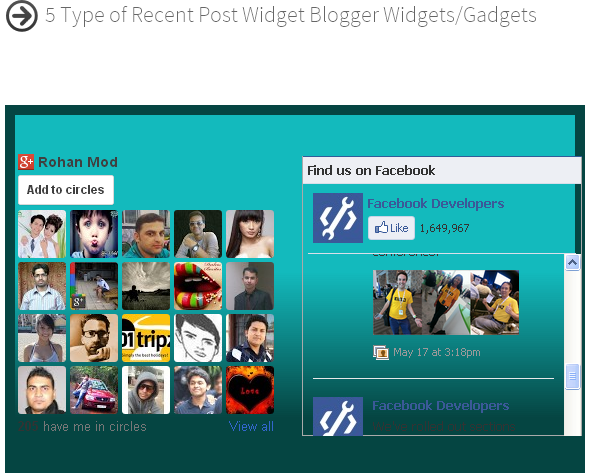 As in the last post we discussed how to add Google plus box widget to blogger below the post title. And now we are going to modify it and will add Facebook like box also. So check out the step by step method to add this blogger widget to your blogger. How to add Google plus and Facebook Like box widget below the post title. Change Facebook and google plus link in red colors with your own links. I hope you like Facebook like box and Google plus add to circle widget for blogger below the post title. Feel free to use and comment if you feel any problem. Thanks for reading. 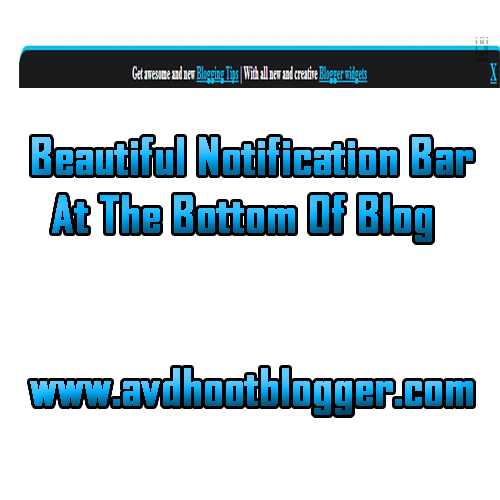 How to add beautiful notification bar at the bottom of your blog, A new widget for blogger, You can insert social bookmarking icons or anything in this widget. There are many things to do with the notification bar at the bottom of blog like, If you want to earn money then you can insert your affiliate links in the notification bar along with you can promote your other blogs through anchor text of your blog's keyword or add social bookmarking icon at the bottom so you get more page views and traffic. So it is your choice what to do with this notification bar. Ok so lets get started, Below are the code and method to add a notification bar at the bottom of a blog with this new widget for blogger. Now copy the below code and paste it before the </body> and you are done. Here are some customization That you have to make. I the yellow highlighted text type your text and in light blue colored text insert your links and you are done. I hope you like this beautiful notification bar at the bottom widget for blogger. 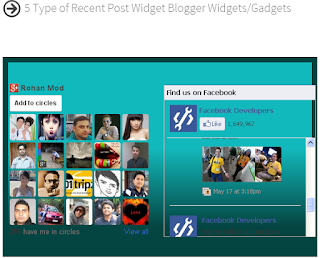 Please feel free to comment if you get any trouble in installing this blogger widget.